Very Smooth with a Mild Finish! When a coffee is named Excellent Aroma, you expect it to smell great. I expect it to smell great as a whole bean, in ground form and when brewed. 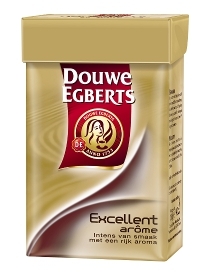 Well, I am happy to report that Douwe Egberts Excellent Aroma is all that its name suggests! When I first opened the package, the ground coffee is darker than I expected it to look. It had a wonderful rich aroma. According to the package, the enjoyment begins when you gently cut into the package and first get a whiff of the pleasing aroma. In fact, the package describes the coffee as having intense aroma with a rich taste. So true! I made some in my drip coffeemaker – the house smelled absolutely wonderful from the brew. I poured some into my mug, just black, and inhaled deeply. The aroma was very mild, with a great just-brewed aroma. A sip of the coffee still black reminded me of a dark roast — slightly bitter (the good way) and sharp, yet with a surprisingly mild finish. With cream and a little sugar, my favorite way to enjoy coffee, Excellent Aroma is smooth and mild. That is, the flavor is gentle and mild, great as a medium roast. Douwe Egberts rates the coffee roast as 4 on a scale of 1 to 7, so it is strong medium roast. Excellent Aroma is a great daily coffee while also being special enough that you can serve it to friends and family on those special days (many of which are going to be here before you know it!). If you like Douwe Egberts coffee, then you must try this one! Get 10% Off Douwe Egberts Coffee and We’ll Treat You to a Cookie! On October 9, 2011 June 3, 2012 By KTIn Coffee is all around! * Coupon code valid until 10/12/2011. Minimum order of $30 required ($10 on tea site). Valid on http://www.EnjoyBetterTea.com for Pickwick tea only. **Coupon code valid until 10/12/2011. Minimum order of $30 required. Valid only on http://www.EnjoyBetterCoffee.com. Not sure about this cookie? 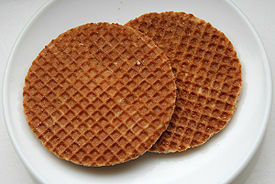 Check out our post on these Dutch treats. On October 9, 2011 By KTIn Coffee is all around! This is a new product we have, so please let us know what you think. You can post messages here or directly on our site. As always, enjoy better coffee !